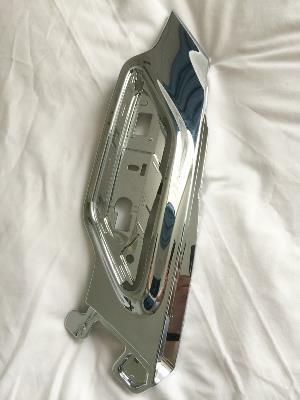 Genuine Mini chrome side indicator scuttle trim mounting for the right side. These are normally only available in pairs but this is the right side only. It does not include the trim pads. This fits Mini R60 and R61 models. The Mini part number is 51132208400 (this part number relates to a pair but this listing is for the right side only). Please check this against your VIN number using the Mini electronic parts catalogue to make sure it is correct for your car before buying. If you do not know how to do this, send us the last 7 digits of your VIN number and we will check for you.